Entergently: Wash your face with . . . OIL!!! Ewwww, that was my first thought when I heard about people washing their face with oil!! Ewww, that just sounds downright gross! I mean who would want to smear oil all over their face?? And why on earth would someone with oily skin, or who wants to keep their skin from breaking out use pure oil on it? I mean aren't we told that oil clogs pores? And of course someone like me, who usually has oily skin and often breaks out has been told to look for cleansing products that don't have any oil at all. Well let me tell ya . . . it WORKS!!! I have been washing my face with oil for . . . oh . . . let me see . . . 2-3 yrs. And the Oil Cleansing Method, as it has come to be called, has been used by many, with great success!! Just a little background on me. I have had skin 'issues' since I hit puberty at 12 yrs old. Yes, I have been struggling with my skin for 22 yrs . . . that is just sad! I have always done everything 'right' too to no avail. You know, you are supposed to clean your face daily, never sleep in your make-up, use oil free cleaner, toner, moisturizer (morning and evening) exfoliate but don't scrub etc. 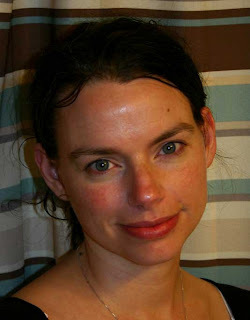 I have tried everything, from natural stuff to prescription meds (that tore up my stomach, that was before I knew better) to Proactive and nothing really helped. Though I will say that the last few years it has been better and thankfully, since Thrace was born my skin is the clearest it has been since I was 12. Not sure if it is age, hormones or just how I am cleaning it now but I suspect it may be a combination. For the last 10 yrs or so I have been using mostly natural products on my face (at least part of the time as I could afford them). But the way I wash my skin now, with oil and honey is by far the cheapest, easiest and actually the most natural of anything I have used before. And my skin has never looked better!! I'll explain the oil part now and save the honey for a different post. Oil dissolves oil! I know that sounds weird but it is true. Your body naturally produces oil, and that in and of itself doesn't cause blemishes. It is the dead skin, hormones, bacteria, dirt etc. that can cause you to break out. When you rub oil into your skin, and open your pores, it allows the oil to get deep down and work out the existing oil and impurities. I have also found that it removes my make-up really well. Well that is going to depend on you and your skin type. Some oils that are most often used are Olive, Castor and Coconut. But some people prefer Jojoba, Sweet Almond, Grapeseed, Sunflower seed, flax seed etc. There are many oils with many different properties. Each oil has it's benefits. Olive Oil (yes, the cooking oil) is a moisturizing oil, so good for those with drier skin. Castor oil (found in small bottles at the drug store or in the pharmacy section at places like WalMart) is great at drawing out impurities. Many people like to do a combination of olive and castor depending on their skin type, and this is something you can experiment with. I tried them both, and while they worked fine, I much prefer unrefined coconut oil and that is what I use exclusively now. I like how it is solid and melts with your skin, it is thinner than the other oils, and it has wonderful health benefits for your skin (as well as body). And I just like what it did for my skin. Choosing your oil is very much a personal thing and you can experiment to find what oil you like best and more importantly what oils your skin likes best. If you are anxious to try it now, just start with what you have. Most people have olive oil around the house maybe sunflower oil. Start there and then you can add different oils to see what works best for you. Another option is adding Essential Oils to your oil for added benefits. Essential oils, diluted in a carrier oil, are wonderfully healing for the mind and body. Depending on the oil you use they can be anti-bacterial, anti-fungal and anti-viral, so something like, a few drops of Tea Tree in your carrier oil can help with problem skin. I often use Lavender as well or you can use them if you just want to make your oils smell "pretty". First, I keep my oil in a separate container. 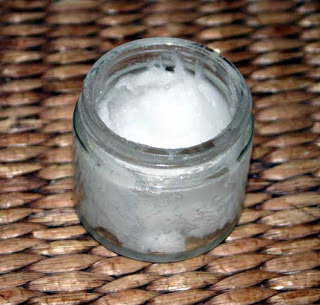 Since I use coconut oil and it is solid (melts with body heat)I keep it in a glass jar (I reuse all my jars for ointments and stuff). Here is my oil jar below. If you are using any of the other oils though it is probably best to keep it in a bottle where you can squirt some out. 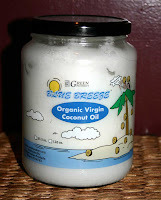 I actually keep a few jars of coconut oil around for not only my face, but dry hands, lips and other stuff. What is involved? OK the short version . . . Simple right? OK I'll elaborate a bit (because I am so good at elaborating, LOL). To start, you want to use a generous amount of oil, don't skimp. You want to make sure you really coat your face well (ewww, I know sounds gross but stick with me, LOL). Apply the oil all over your face! It is important to really rub it in and massage it everywhere. You don't want to be too vigorous though, just a gentle massage all over. And take your time to really work it into your pores. If you have on make up, make sure to gently get around your eyes and lashes (and I will often take some tissue to wipe off my eye area after working the oil in so I am not smearing that eye make up all over my face). Many people recommend massaging for 5min or more. I rarely have that amount of time (or patience) so I will only do it for a min or two. But I try to take time once a week or so to spend more time on it. I think taking more time allows the oil to really get deep in your pores better. Next you will want to open up your pores. Once you have rubbed it in really well, run a washcloth under hot (or very warm) water, squeeze and place over your face. I usually only let it lie on my face maybe 10 sec for lack of time, but if you can sit and relax and just leave it on your face for a minute or so that would be ideal. The heat will help open your pores and let the oil get in and work out the dirt and oil and stuff. After removing the washcloth continue to massage your face again, working the oil into your pores. I spend maybe another 30 sec on this before I finish up. To finish, remove ALL the oil. 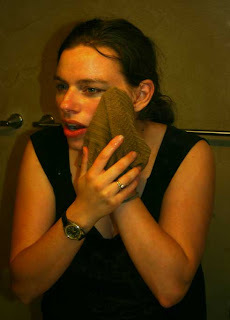 Use your washcloth, rinsing and wiping as needed, to get all of the oil/make up/dirt/dead skin etc off of your face. Don't be too rough, you don't want to rub, just gently wipe. And the washcloth needs to be very warm. If you have ever worked with oil you know that oil and cold water don't do well together. It is important to remove ALL of the oil from your face. Using the oil for cleaning won't clog your pores but if you leave copious amount of oil on your face it will!! Make sure you get into your hairline, as people have reported breaking out there because they didn't do a good enough job of removing the oil. But don't worry too much about it. It is super easy to get all the oil off, just a few wipes (takes me maybe 20 seconds), rinse, a few more wipes and that is usually all I need. At this point, if I want to really do an extra deep clean, I will sometimes do a second wash with oil (since my make up is off now) but most of the time I don't. You may find, shortly after washing your face with oil, that it has done such a good job removing oil from your skin that your skin feels dry and tight. I am a HUGE advocate for moisturizing. For some people they will finish up with putting a drop or 2 of oil on their hands, rubbing it in and then patting it on a moist face. The way I understand it, the oil doesn't moisturize in and of itself, what it does so well is lock existing moisture, so applying it to a moist face or with moist hands is needed. But you know, I have found that that isn't enough for me, and my skin was getting very dry, so I use a natural moisturizer (which I use after washing my face at night, and in the morning before putting on make up). Your health food store will have plenty of brands to choose from and Burts Bees makes fairly good and fairly natural (always read the labels) moisturizers and they are now found in many regular stores. Again, play around with it and see what works for you. And keep in mind that sometimes it is possible for your face to break out a bit as the impurities leave the skin (didn't happen to me, but I know it can) but it should get better quickly, if it doesn't, try a different oil. And now, without further delay, here are my before/after pictures!! 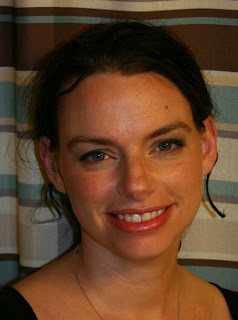 I actually put on extra make-up for the first one, though the flash still washes me out so you can't tell so much. But alas . . . here they are. I do this every night, and though I am long winded and have typed out a lot of stuff here, it really only takes a few minutes . . . certainly not much longer than washing my face with any other cleanser. In the mornings I will either just wipe my face down with a washcloth before applying moisturizer, or I will wash it with my homemade honey scrub (honey is amazing for so many thing). Anyway, I encourage you to try it. I don't think you will find anything more simple or cheap. I love that if I am away from home and forget my oil, I can just hop on over to the kitchen and there is all I need to wash my face, LOL! OK, got the honey scrub recipe up!